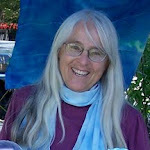 Studio Notes: Playing in the Studio--an ART Weekend! I'm still high. 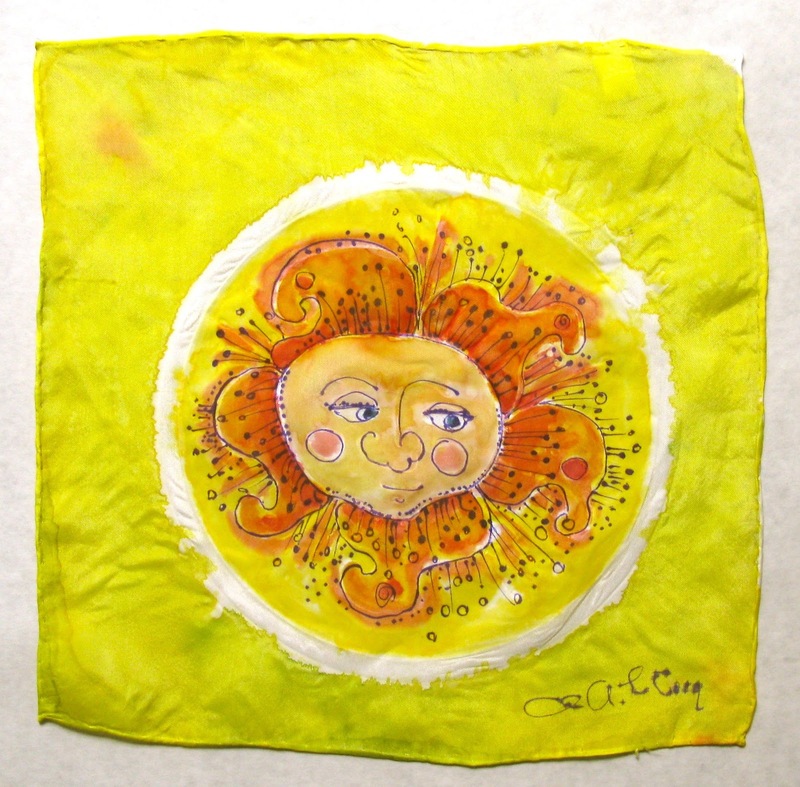 Three of my art buddies came Friday evening for dinner and stayed the weekend, painting on silk! Left to right are: Ginger Landree, Chris LeCocq, me, and Elizabeth Blake. Ginger is looking a little apprehensive because we spilled a bottle of red dye and some landed on her. My green rug may never be the same again, but hey! It was well worth it! I can't think when I've experienced more joy! I fell in love with Chris's sun! 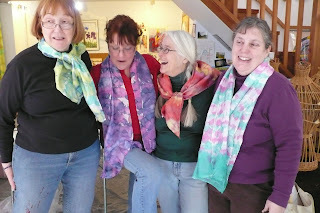 We Shibori dyed scarves Elizabeth brought, then experimented with resists including a salt solution, and with dyna flow fabric paints. The shibori dyed scarves we did with Jaquard red label dyes are stunning! Chris LeCocq's Sun was done on an embroidery hoop (hence the white circle) with pebeo water based gutta on silk treated with a salt solution. She finished it off with a very fine point Bic permanent marker. Then she gave it to me!! Saturday evening we watched a video of artist Terry Turrell at work, and got even more inspired.